Amazon Price: $64.95 (as of October 18, 2017 7:02 am - Details). Product prices and availability are accurate as of the date/time indicated and are subject to change. Any price and availability information displayed on the Amazon site at the time of purchase will apply to the purchase of this product. The once almighty power of the Doge (elected ruler of an Italian city-state)of Venice was coming to an end, with the Doge himself, slipping from life. From the rich regalia of office, here is a last token of forlorn devotion to the bereaved Renaissance Lady of the Palace. 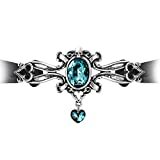 This pewter choker is styled amoung Baroque scroll work, set with a large Swarovski crystal and with a matching crystal heart dropper, on a black satin velvet hand-tie ribbon. Approximate Dimensions: Width 3.46" x Height 1.97" x Depth 0.43" Materials: Fine English Pewter Casting with Swarovski crystals. Black velvet hand tied ribbon, for tying-off at your own length.